The Google Cloud Print service promises to make Web-based printing--free of driver requirements and physical connections--a reality for anyone with a Gmail account and Internet access. (HP's ePrint service launched earlier, but ePrint works only with a small group of HP printers.) We tested Google's first publicly available Cloud Print beta last week. Its capabilities are still extremely limited. Within those restrictions, however, it has proven more reliable so far than the service we saw during our first forays into HP ePrint. 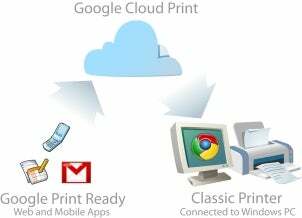 For now, Google Cloud Print works only with sending devices that run Google's Android or Apple's iOS operating systems; in addition, the receiving printer must be connected to a Windows PC with Internet access. (Support for other platforms is in the works.) If you possess the magic combination, check out Ian Paul's step-by-step tutorial on how to install and use Google Cloud Print. Once you've updated your copy of Chrome to the latest beta version (9.0.597.83 as of this writing), simply activate the Google Cloud Print Connector and link your Google account with the printer(s) attached to your PC. You access Google Cloud Print through the Gmail Website on your mobile browser. A Print option becomes available for printing either an e-mail message or its attachment. Our Google Cloud Print testing started off badly. When editorial assistant Alex Wawro tried printing simple e-mail messages from his Android smartphone, he couldn't get it to work right--he'd send job after job, to no avail, until all of them suddenly spilled forth in a single batch hours later. After contacting Google about this issue, we learned that it was a known bug: For the moment, Google Cloud Print doesn't play well with Gmail addresses that include capital letters. Google promises to deploy a fix in the near future. After Alex created a new e-mail address without capital letters and linked it with his printer via Google Cloud Print, print jobs that he sent from his phone printed nearly instantaneously. As for attachments, Google can print only files with .doc and .pdf extensions right now--leaving the common .docx extension and a lot of other attachment types out of luck. The company says it is in the process of testing other file types. For now Google Cloud Print is mostly a cool concept, since it's a beta and it doesn't do much. Still pending is support for additional OSs, e-mail platforms, and applications, not to mention more printable file-attachment types. As Google Cloud Print steadily evolves, however, it should work on pretty much any existing printer, even the old beater that you might have cranking away in a dark corner of your office. That sort of inclusiveness will be essential to cloud printing's success. Google is also working with printer manufacturers to develop "cloud-aware" printers that won't need Google Cloud Print Connector. Watch PCWorld.com for more cloud-printing news and testing as it happens.